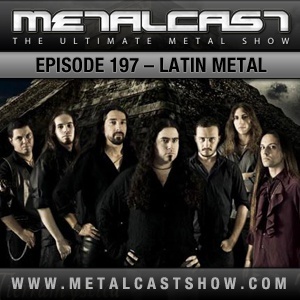 Latin Metal or Metal with exotic influences. That was the basis for this episode. While there are many bands that incorporate such elements into their compositions, it’s not always easy to find those bands, let alone find them appropriate for this episode. One example our quest originated from was Diablo Swing Orchestra. And so the crew searched wherever they could and found bands and songs that would make this a very interesting Special. Once again we explore the boundaries of Metal, or better, the exotic terrains of Metal. As spring is drawing near, the weather improves and this episode should already put you in the right mood.Tune in, leave your feedback at the usual places and keep on rocking! 08. Kiko Loureiro – Se Entrega, Corisco! What should I say about this EP? How about just like a perfect neclace consisting of pearls with exotic shades? Every pearl is shinning unique radiance and you just want to hold it in your palms and it flows away anyway just like mercury… I’d say this EP will definitly reside in my limited Ipad harddrive space for the longest period so far. Yeah! I am expecting the next episodes…especially the 200th, wakakaka! i was surprised you didn’t put any sepultura or soulfly on it. btw Kobe i have such a quechua tent as well, it rocks. Never heard of this band before. Maybe Marcus or Si? Will check it out later! Thx! Oh yes, the pioneer ep would be the right one for that band. Metal never made me feel like dancing… until now! Ole!